YouTube test a stereoscopic player for watching videos in 3D. 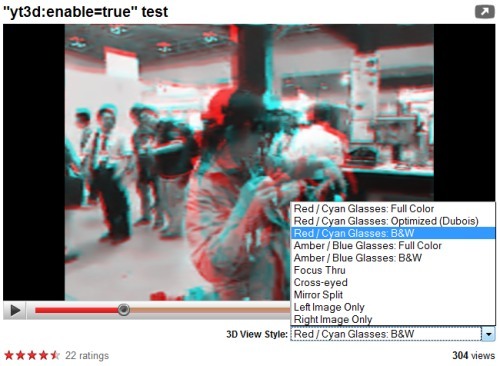 If you go to this video, you'll notice a drop-down that includes some options for red/cyan and amber/blue 3D glasses and some options that don't require glasses. "Stereoscopy, stereoscopic imaging or 3-D (three-dimensional) imaging is any technique capable of recording three-dimensional visual information or creating the illusion of depth in an image. The illusion of depth in a photograph, movie, or other two-dimensional image is created by presenting a slightly different image to each eye," explains Wikipedia. I'm the developer working on the stereoscopic player as a 20% project. It's currently very early, hence the silly bugs like swapping the eyes for the anaglyph modes. A fix for this is in the works. You can try the new feature by searching for yt3d:enable=true. I chose the "Focus Thru" option. Then crossed my eyes to make the 2 images overlap. I was able to see it 3D that way. But some people can't do it, and it's kinda straining on the eyes. Not anaglyphic 3D! You simply cannot have all future content wasted like that. Side by side or double frame rate with shutterglasses - anything that retains original quality video. Great! I was waiting for something standard to distrbuite my 3D videos! I know of an Israeli Company named "Taatua" that has been developing such a 3D solution for real time systems. Has anyone else heard of them?? you can check their website at www.taatua.com, not much there but contact info. Suggestion: Double the bottom control bar when in crosseyed mode, maybe use some sort of flash trickery to double the mouse cursor also for ease of controlling the video. Other than that pretty spiffy. its great.. i got a 42" TV an watch now with good 3d glasses. I think, the Idea is good. But why are there mistakes added to my videos? The better the movie, the more terrible the destruction by YouTube. 1.2 GB for 5 and a half minutes. I delete my movies. Tell me, when you are ready. Also try searching for Channel 4 3D Week to see more entries. These video animations are created in After Effects and really deliver the depth and out of screen experience that 3D does so well. Maybe you could combine inexpensive head-mounted magnifiers (e.g. http://www.atafa.com/sports/products/Carson_x_x_Dual_Power_FlipUp_Head_Mounted_Magnifier-219549.html) with a small device like an iPhone or Touch having a hi-res display (I think Apple is coming out with newer devices with better displays). This is good. But if you really have a 3D Monitor you would like to show the video in full screen with vertical line by line rendered on each eye. For some reason that does only work when not in full screen. When will this get fixed? Thanks a ZALMAN monitor user. looks good so far. be intersting to see if the passive circular polarised format will be used to match the new monitors and laptops coming out. I got some decent looking wraparound 3d glasses from i-3k.com and they work fine with the new 3d vids. I've made a page wich show the 3d vidéos from youtube. Those vidéo are order by rate and are refresh every hour. i feel dizzy seeing those video picture above... don't know whether i feel comfortable watching 3D video on YouTube... do we need some sort of 3d glasses to watch it....?